Parts three and four of Maximilian's "WEEK OF!" 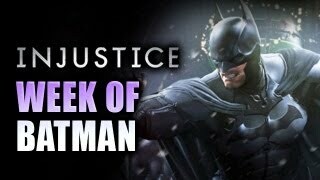 Batman in Injustice: Gods Among Us have been posted. Watch the online warrior climb up the Injustice ladder inside. Maximilian is continuing his "WEEK OF!" Batman in Injustice: Gods Among Us. Above are parts three and four with the DC Comics stalwart in the online world of Injustice. For parts one and two, click here and here.